technological innovation in the fields of energy and the environment. Her M.Sc. Studies at AUST were supported by the African Capacity Building Foundation (ACBF) through a special grant which specifically targeted young Women in Science and Engineering. university. The purpose of the award is to foster the emergence of a new generation of African researchers, offering them the opportunity to pursue a PhD program in a collaborative environment involving work within Eni or other industry partners and a small selection of prestigious Italian universities and research institutes and supporting their research and innovation on the various scientific topics promoted by Eni. Blessing has already left for Italy, where she will pursue work towards a Ph.D. degree at the Politecnico di Milano, working on the efficiency of off-grid renewable energy systems in Africa. Just remember, you have to be nominated. Self-nominations will automatically be rejected. 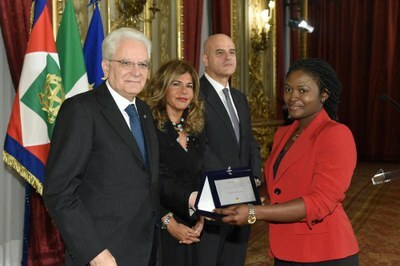 L-R in the photo: President of Italy, Mr. Sergio Mattarella; Ms. Emma Marcegaglia, Chair of the ENI Board; Claudio Descalzi, CEO of ENI and the Eni award recipient Ms Blessing Ugwuoke during the award ceremony in Italy recently.